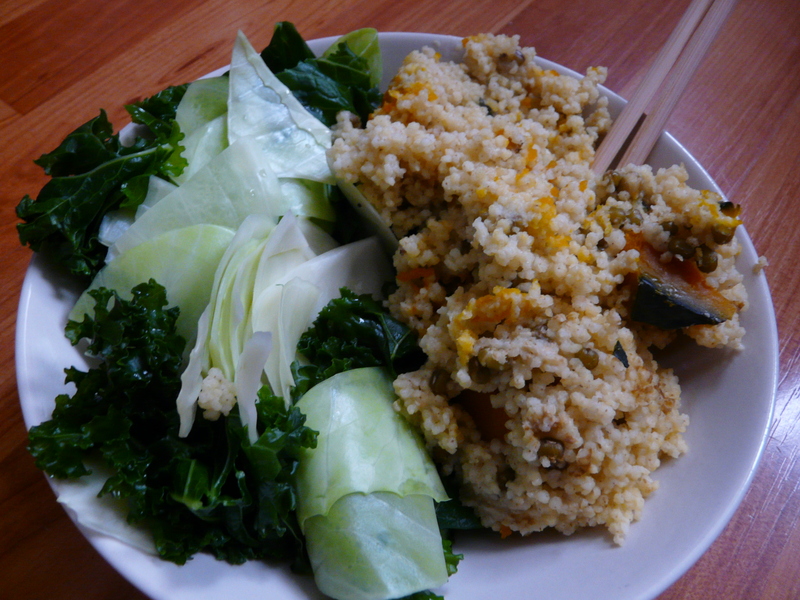 I made a nishime of daikon, turnip (even with some turnip greens), parsnip, topinambour (Jerusalem artichoke), carrot and butternut squash, seasoned with ume plum vinegar. 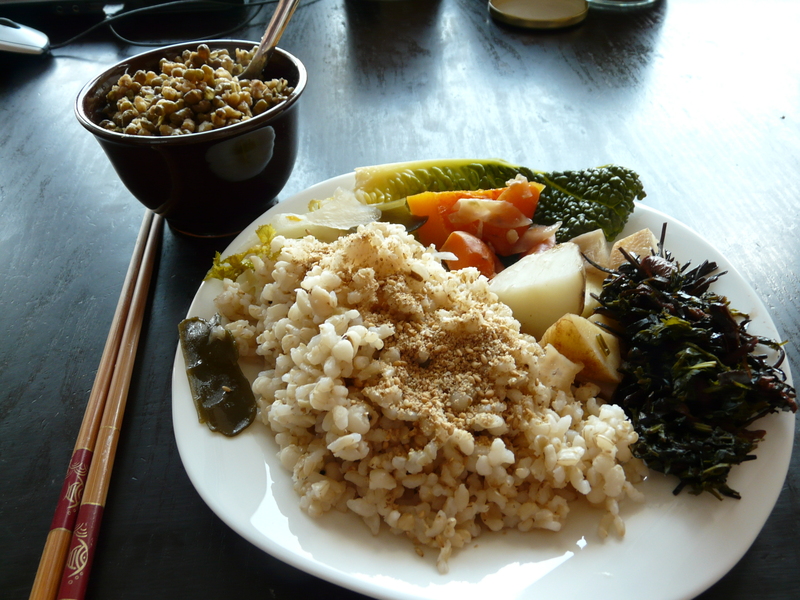 Arame seaweed was cooked for about half an hour together with finely chopped carrot tops (extremely fiber rich! ), presoaked dried daikon and shoyu. Mung beans flavoured also with a splash of shoyu. But anyway, I made some quick extra greens – shortly blanched kale and cabbage. You just bring a pot of water to boil (enough water to have the veggies covered later on) and when it starts boiling, transfer the vegetables inside and let them cook for just about a minute or two (they should get a deep green yet bright colour and become softer yet firm and crispy – a bit of a challenge, yes! 😀 trial and error!). For dinner I had the leftover grain from lunch (with new and not burnt!! 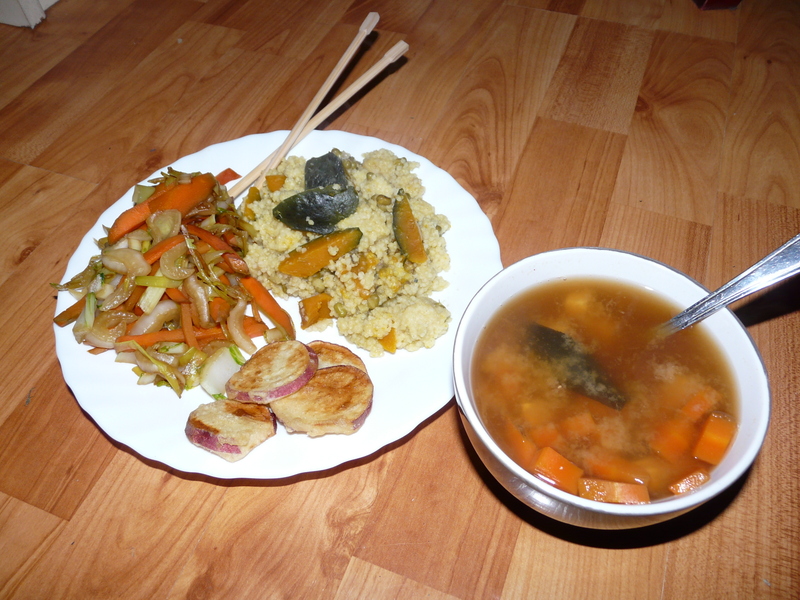 self-made gomasio) plus I made a quick miso soup with carrot and tofu cubes. In a wok I sauteed (with no oil) paksoi, carrot and leek, seasoned with tamari and mirin. And I had to try out my newly purchased tempura pan and made a glutenfree deep-fried tempura: sweet potato slices dipped in a batter of brown rice flour+kuzu starch+water (you have to experiment with the consistency, that´s the hard part!) and deep-fried until golden. It was a great success, I really liked it!